LILONGWE, Jul 29 2011 (IPS) - Unless Malawi’s government does something to find solutions to its economic and governance problems, the country will see more nationwide protests like the ones last week where 18 people were killed and 275 arrested, analysts say. The Jul. 20-21 protests were the first of their kind since the country attained democracy in 1994. Amid condemnation from the international community, President Bingu wa Mutharika called in the army to quell the protests in three cities; Lilongwe, Blantyre and Mzuzu. The media had also been restricted in reporting on the demonstrations. Mustapha Hussein, a political analyst at the University of Malawi, told IPS that Mutharika should start taking the concerns of Malawians seriously before things get out of hand. “The president seems to not be ready to accept blame for the economic and governance problems facing the country. There will be bigger protests in the country than what we just saw should the government not move fast in addressing the issues that are being raised,” said Hussein. Dalitso Kubalasa, executive director of the Malawi Economic Justice Network (MEJN), a coalition of more than 100 civil society organisations which promotes economic governance, told IPS that the lack of response from government about the issues raised by demonstrators does not help the country. “The whiplash that we are witnessing all around us – internal and external – from development partners and other stakeholders is continuing to paint a lot of gloom, and is ultimately not projecting the hope Malawians seem to be longing and craving for or that has been long awaited,” said Kubalasa. Currently, tensions remain high as fuel queues keep getting longer as people seek out the now scarce commodity. There is also an acute shortage of foreign exchange, households and businesses continue to experience frequent and long spells of power outages, and water scarcity is still a problem – even in the country’s affluent neighbourhoods. Mutharika has still not responded to the demonstrators’ demands, which included a call for the president to work on the restoration of the economy and democratic governance. The protests came just as Britain announced it was suspending 35 million dollars of budget support to Malawi. Up to 40 percent of Malawi’s national budget has been dependent on donors and 80 percent of the country’s development budget was being provided under the Common Approach to Budget Support, which includes Britain, Germany, the African Development Bank, Norway, the European Union and the World Bank. The British and German governments are already refusing to release up to 400 million dollars. However, during the June budget session of parliament Mutharika insisted that Malawi will be operating on a zero-deficit budget so that it will not be dependent on donors. Speaking at a graduating ceremony for new police officers on Jul. 22, Mutharika said he was the only one concerned about running the country well, and that no one should pressure him on the issue of fuel. But after government’s disastrous handling of the protests, the Millennium Challenge Corporation (MCC), a United States government foreign aid agency leading the fight against global poverty, announced that it was putting on hold 350.7 million dollars meant to improve Malawi’s energy sector. The MCC said in a statement on Tuesday that it made the decision because of the use of force by Malawian authorities to prevent peaceful demonstrations, and the restrictions imposed on the media reporting on those demonstrations. The southern African country is already reeling from poor relations with its traditional donors who have also accused it of failing to respect the human rights of lesbian, gay, bisexual and transgender people and the right to freedom of the press. Even though Tina Kaduya’s grocery store was looted during the demonstrations and she lost all her stock, she supports their demands. 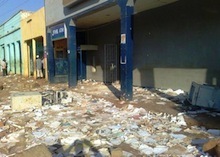 “I have lost goods worth about 2,000 dollars through the riots but I can’t blame the people who attacked my shop. Many Malawians are angry because of the declining standards of living and many are poor so they saw an opportunity (to loot) when the demonstrations were happening,” Kaduya told IPS. She said government has not helped matters by introducing a value-added tax (VAT) of up to 16.5 percent on products such as bread, meat, milk. In the 2011/2012 national budget, delivered June, the country’s minister of finance, Ken Kandodo, announced the introduction of taxes that also include a 25 percent excise duty on used clothing, furniture and toys. “The country is staggering under miserable economic and governance problems. There’s need for change and much as I worry about the loss of revenue after my shop was looted, I do understand people’s actions,” said Kaduya.